In the video “V presents Sons of Vikrant” by Bajaj Auto which is to relive the 1971 Indo-Pak War through the untold stories of the brave officers who served aboard the invincible INS Vikrant, India’s first aircraft carrier. The first speaker in this video is Commodore Medioma Siavaxa Bhadha, who was born on 21st March 1940 in Belagavi and studied in St.Paul’s High school and passed out in 1956. He sums about his relationship with the ship in memorable words: “In one word, mother” l. Some of the Paulites would recall that he occasionally flew the Navy planes over Belgaum (now Belagavi) from his base at Vasco. His brother taught at St Paul’s and used to reside in the bungalow near Police quarters in Camp. sophisticated ships but I think there will never be another across the airport on land like INS Vikrant. Son of the Panthaky of the Agiary, Medioma had a very humble beginning with a strong religious background. 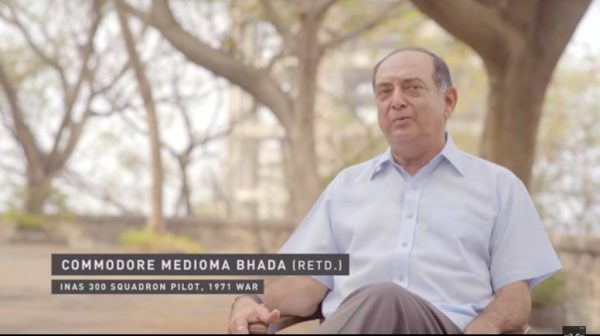 After completing his schooling in Belagavi, Medioma graduated from the National Defense Academy, Khadakwasla and was commissioned in the Indian Navy in Jan 1962. He opted for the Aviation Branch of the Navy and was awarded the coveted “wings” in 1963 after graduating from the Air Force Flying College. Soon thereafter he was posted to the Navy’s frontline Squadron INAS 300 flying the Seahawk jet fighters and qualified as an operational pilot by Day and by Night from the Aircraft Carrier INS Vikrant. He has the distinction of being the first Parsee to land on the aircraft carrier. He saw action in the 1971 Bangladesh Operations and was in the first wave of strike aircraft to take‐off from INS Vikrant to carry out bombing attacks on the ports of Khulna and Chittagong in erstwhile East Pakistan. He has held many coveted appointments during his thirty five years in service. He has been a flying instructor at the Air Force Flying Academy and on the faculty of the Defense Services Staff College at Wellington, Nilgiris. He was Director, Naval Air Staff at NHQs, Delhi and was responsible for the induction of new aircraft and a Naval Air Station at Arkonam. During his career he has commanded Ships, Air Squadrons and Naval Air Stations. On retirement from the Navy in the 1994, he has held prestigious assignments in the Corporate world including that of a CEO of a chain of Hotels. He has settled down in Mumbai and now runs his own business in Facility Management. He is the Vice President & Founder member of the Mumbai Citizens Group, a Registered NGO, which has been in the forefront in exposing the Adarsh Scam and is presently spearheading an effort for the establishment of an Inter State Bus Depot for private buses in Mumbai. He is also a member of the Dockyard Lands Regeneration Forum which is actively pursuing through a PIL, the termination of the environmentally disastrous construction the Offshore Container Terminal in the heart of the city. Medioma is a keen golfer and is President of the Addicts Golfing Society of Western India and is on the Governing Council of the Western India Golf Association. With inputs from afternoondc.in and Rajendra Pai.